Thick or thin, Rhode Islanders love their tomato sauce over pasta or as soup broth. No wonder, since 19 % of its residents are Italian – purportedly the highest percentage of any state. Between 1876 and 1924, over four and a half million Italians arrived in the US, establishing communities in the Northeast, often referred to as “Little Italys.” Noted for their hard work ethic, many became fishermen, shoemakers, waiters, fruit sellers, and tradesmen. Most were blue-collar unskilled laborers working construction and excavation jobs, necessitating they skimp on food in a desperate attempt to save money. 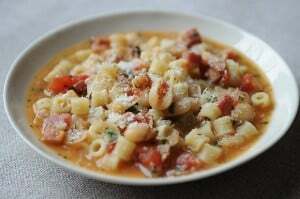 Due to the cheap availability of pasta and beans, the peasant dish of pasta e fagioli, colloquially and commonly referred to as pasta fazool,originated. The historic neighborhood of Federal Hill in Providence, RI became one of the most densely populated and largest Italian settlements in the nation at the turn of the twentieth century. Presently, the percentage of residents with Italian extraction have spread their ethnic roots to the outskirts of Providence and North Providence, as well as the communities of Johnston, Westerly, Cranston, Warwick, and Bristol. Naturally, pasta fazool is a favorite dish served in restaurants throughout the state primarily as an appetizer, or a hearty meal cooked at home. Full of beans, just one bowl of pasta e fagioli supplies nutrients promoting good health. Beans provide an excellent source of fiber, and pasta fulfills our carbohydrate intake. Plentiful vitamins include thiamin, riboflavin, niacin, A, B6, B12, C, and E, folate and pantothenic acid. Minerals such as iron, calcium, magnesium, and phosphorus, potassium, zinc, copper, manganese, and selenium abound. As with many regional specialties, pasta e fagioli has many variations so there are numerous recipes. My recipe is quite simple and low in fat as I skip the olive oil. Thrifty, tasty, and nutritious – be sure to have a fresh loaf of crusty bread on hand. We Italians not only enjoy breaking bread with family and friends, but dunking a hunk or two in the tomato enriched broth. 1.Into boiling water add bouillon cubes, tomatoes, Italian seasoning, onion powder, pepper, and celery. Stir in pasta. Reduce heat. Simmer, stirring occasionally until pasta is tender – 10 to 11 minutes. 2.Stir in beans; cook until beans are heated through. 3.Serve immediately and garnish with cheese. Sedersi a tavola. When Italians sit down to eat we forget about our troubles, preferring to bask in the love and camaraderie of family. Though pasta e fagioli is considered a peasant dish because it is a thrifty meal, it is rich in flavor and nutrients. The rhyme from Pastafazoola, a 1927 novelty song, puts it succinctly – “Don’t be a fool, eat pasta fazool.” Pass the bread, please. Under Mother’s tutelage, Eva Pasco became a proficient typist by the age of nine and soon pounded chapter stories replete with dialogue on her girly-pink Tom Thumb typewriter. In high school she composed her first novella earning its own reserve shelf in the library. On the fast track of college, Ms. Pasco’s penchant for writing deferred to churning out term papers. Throughout a rewarding teaching career she dedicated her craft to drafting curriculum, developing student proficiency in creative writing, and penning poignant notes to her charges. Undergoing a mid-life renaissance, Ms. Pasco rekindled her passion for storytelling by composing fiction that taps into significant issues affecting the lives of women where the setting is her native state of Rhode Island. UNDERLYING NOTES (238 pgs) – a midlife journey of self-discovery and reinvention – winds past Rhode Island’s affluent coastal communities, prominent landmarks, cherished institutions, and olive oil spills of the underworld. Ms. Pasco is a featured writer at The 60s Official Site where she has contributed nostalgic memoirs and flashbacks. These memoirs have been compiled in a FREE eBook: 100 WILD MUSHROOMS, available for download at Scribd.